One of the lightest most wonderful salads of the Japanese cuisine is the sunomono salad. The frase sunomono means “vinegared food.” When people think of vinegar they think of some foul tasting. The Japanese use rice vinegar which is not that sour as normal vinegar. The dressing used for this salad is called Amazu which means Sweet Vinegar, which precisely describes the taste. This salad is really light and crisp. It is perfect for hot summer days when you need something that tastes fresh. I made mine with shrimp and surimi, but you can use other fish ingredients. The dressing is a sweet sauce that also very fresh. The idea is to add barely enough dressing so you taste the salad, not the sauce. Peel and core the cucumbers. Julian the cucumbers into small spaghetti like strips 1/8 of an inch thick. If you have a mandolin this process is much faster. Cool the cucumber in the refrigerator. Cut the surimi into small pieces. To assemble the salad make sure all the ingredients are cold. Add the cucumber strips into the bowl. Add about 1 Tablespoon of sweet vinegar. 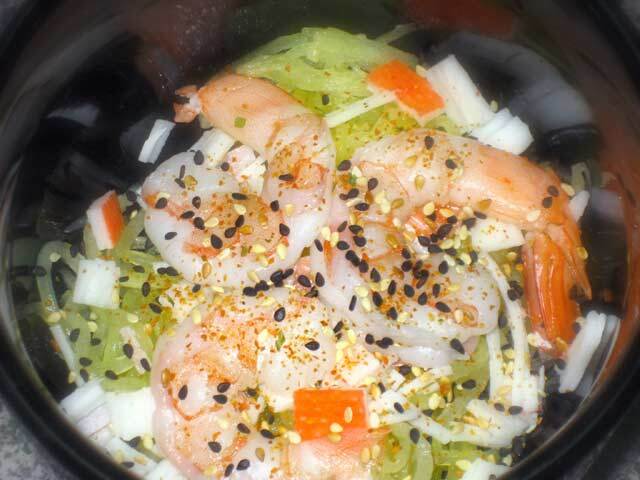 Add the surimi and the shrimp. Sprinkle with sesame seeds. Variation — You can also use cooked octopus, and furikake as toppings. Add water to a small sauce pan. Dissolve the dashinomoto. Add the sugar and vinegar. Boil until the sugar is dissolved. Cool down. Place in the refrigerator to make it cold. For this this you need the dressing to be cold.